Students looking for doing distance education, we have a good news for all of you. 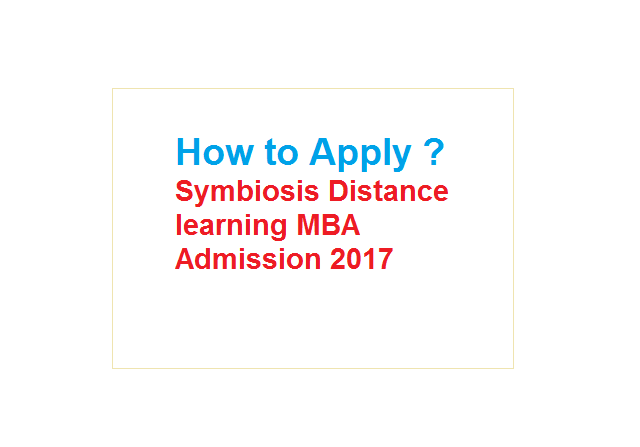 You all can now apply for MBA in Symbiosis Distance learning MBA Admission 2018. Located in Pune, Symbiosis is a very famous university providing the best education. It has an attractive and amazing infrastructure and education facility, materials, lectures and other activities in which students take part. Students from all over the world come in Symbiosis to pursue their education, many of them do distance learning. Symbiosis university provides distance learning which includes Online Classrooms, E-Mentoring, Self- Learning Material, E-learning. There are many advantages as well as disadvantages of doing Distance Learning courses, but it is highly beneficial for them who are doing job as well. Symbiosis is considered as one of the best university for distance education. Thousands of students enrol every year in this university for various courses. The admission process for MBA and all other courses include only 3 major steps which you need to follow. Make sure you follow all the steps correctly. You need to purchase the application form. You can purchase it online or from SCDL Pune Campus. If you are buying it online or from campus, in both case you need to pay 1500/- which is the cost of Application Form. The application form will not be delivered by post in any situation. As per guided by the SCDL you need to follow the application form with all the required documents. It is mandatory to attach a photocopy. Don’t forget to attest the documents. Submit the form with 2 passport size photographs. Make sure the photo is latest. If you have not appeared in any kind of entrance exam then you need to first qualify the SCDL-PGDBA Entrance test. Students who qualify in the examination, have to pay the whole fees before 30 days of the date. The process is same for the students who are not Indian. You need to pay the first instalment of the fees at the time of submitting the application form. If you want to pay through cash you need to visit the campus. Or you can pay via card or demand draft which you have to make by writing ‘The Director, SCDL Pune’. In case, the demand draft is lost, or you send the cash through post to SCDL Campus, the university will not be responsible for any loss. Payment through cheques are not at all accepted. Follow these three steps and start studying your dream course through distance learning by becoming a part of symbiosis. We hope you get admission easily and start your education and make your career bright. Find out all the related inform on the official site of Symbiosis university www.scdl.net/.